This Star Kids Snack and Play Travel Tray gives the kids a great surface for treats and little toys, even to drive the cars around or hold parts to toys while they play with something. It is very simple to use, and straps around most car seats and boosters. 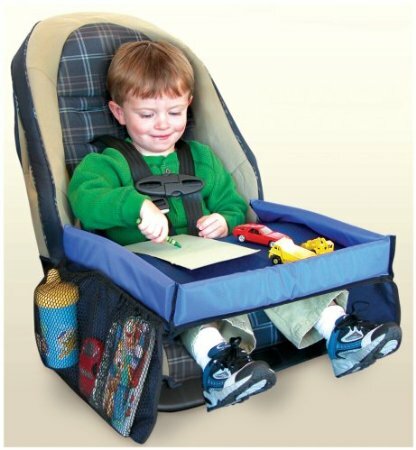 It is important that it straps around the whole seat and not just around your childs waist. I also used this with my stroller and it works pretty well to hold a book and a couple of crayons. If you have an on the go family and are always in the car it seems this is perfect for you. The Star Kids Snack and Play Travel Tray is pretty soft and pliable so if there was an accident it would fold down really quickly, it has no hard parts on it to poke or fly off either. There are two mesh pockets on the side of the tray where you can store books or toys and it keeps it all in one place. 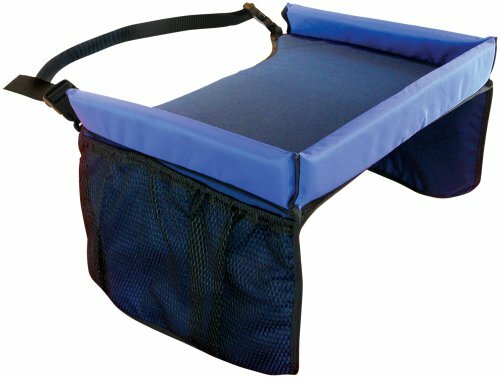 It is made with soft, durable nylon, with foam on the inside that folds instantly should there be an impact. There is a 2 inch high wall that goes all along the tray to keep things from falling off onto the floor. Star Kids Snack and Play Travel Tray is easy and safe to use, it is also machine washable. You will want this for summer trips!